Mckenna and Ethan came up to Provo to stay the week with Justin and Tawsha. Today was my day off so I decided that I would take them out before they went home. We went to this placed called the Kangaroo Zoo. When I first heard of it I was pretty excited because I thought it was a real zoo with kangaroos but it wasn't. It was still a pretty cool place though. It is a place with all these giant blow up slides and bounce houses and such. 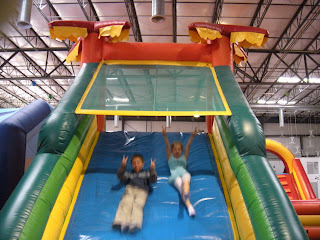 We had a lot of fun running and bouncing around!! 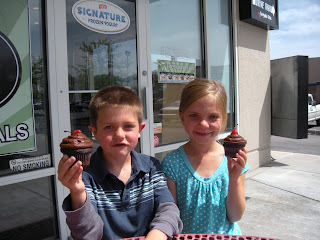 After we left they we decided to go to the Sweet Tooth Fairy Bakery.....Which I just discoverd the other day. It is probably like the best place ever. They have cupcakes cookies brownies and all sorts of goodies. We all got a cupcake and boy were they delicious! Thanks for taking them Dani! They had a blast. You're the best sister and aunt ever!